Thanks for all these updates, Tony, excellent work. 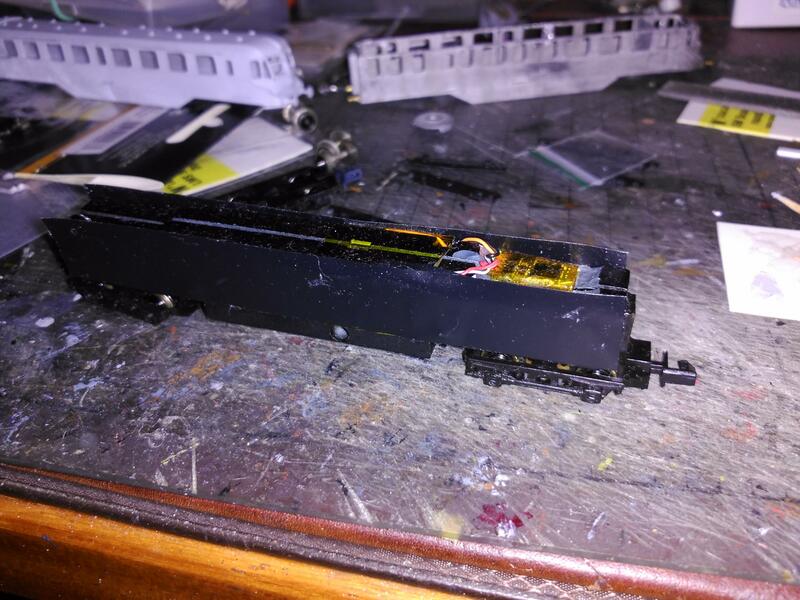 Well long time and no updates, so here goes, first up is the 64xx to 74xx conversion that I did for Chris in Prague, which basically consists of removing the auto gear from the buffer beam, squaring off the curve of the bunker to make a right angle and adding the beading and adding hand rails to the running plate. Next up was this Stainer Princess kit (BH Enterprises) I bought from Hattons for £10, and it even had name plates also! 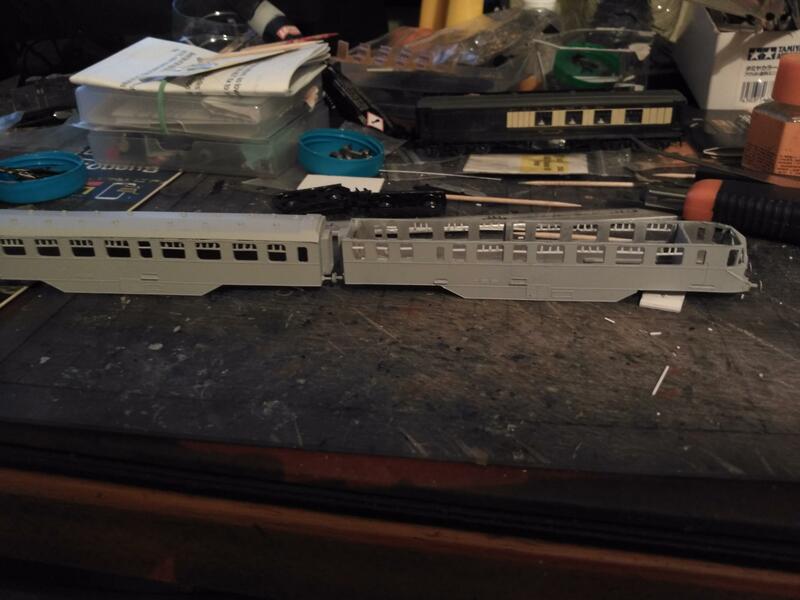 Bought a second hand duchess chassis and modded everything to fit, railmatch paint sprayed on, fox lining. 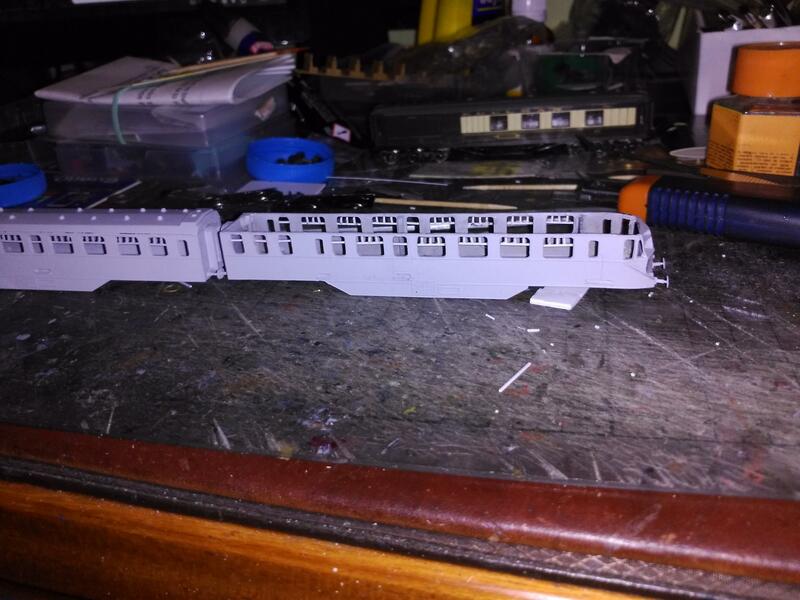 Next is a project that I am still working on, which is a Langley twin rail car. Still some more filling and priming to be done. 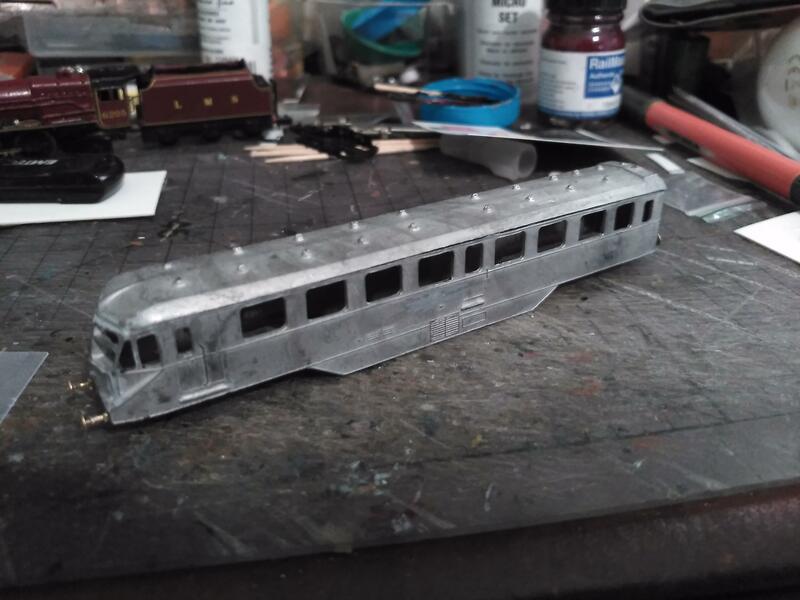 The trailer car, I have made a Plastikard floor up for this, as the white metal one included in the kit was going to make way too heavy. 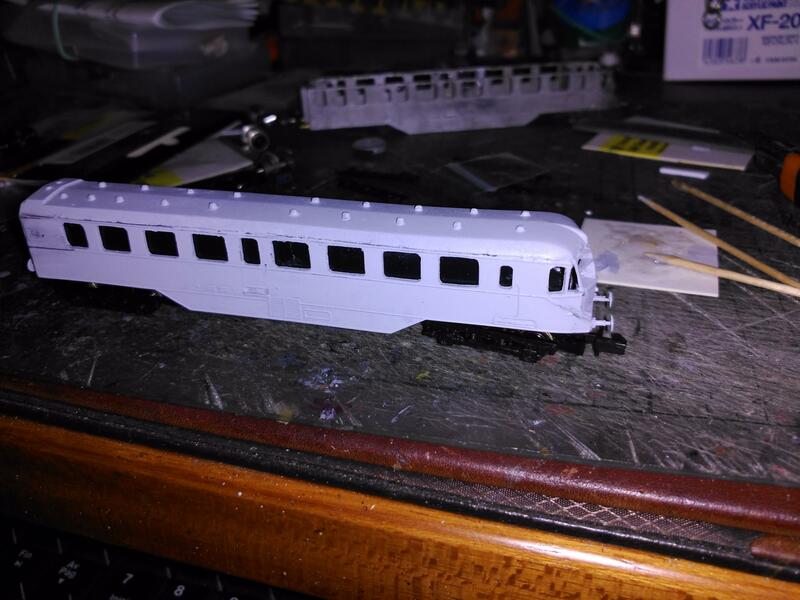 Trailing car bogie with white metal overlay glued on. Many thanks for this update, Tony. 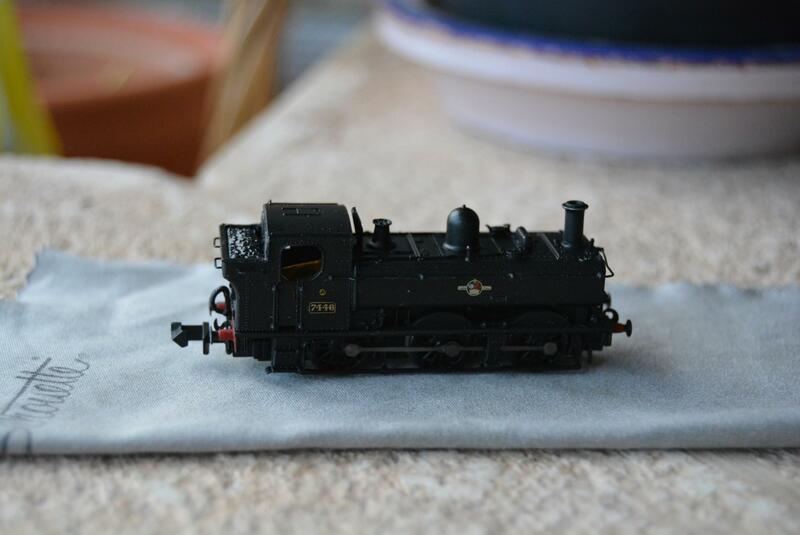 You did a superb job on the 64xx to 74xx (7446, of 83E, St. Blazey, 8/50-4/62) conversion. Thanks a lot. The Stainer Princess looks very good, too. You must be very pleased with it. 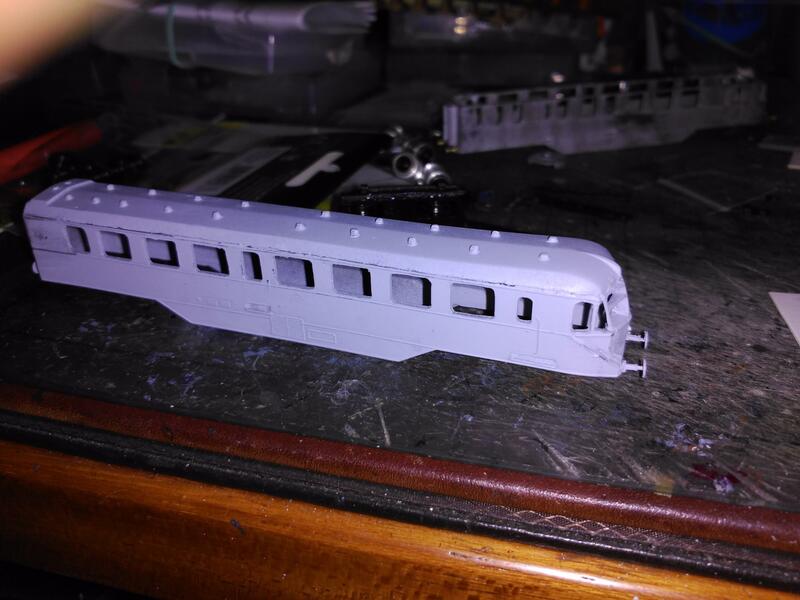 Very good progress on the Langley ex-GWR twin diesel railcar set using a Graham Farish ex-GWR diesel railcar chassis, too. It should be W33W plus W38W but I'm wondering whether its final livery was the original, lighter BR DMU green ('malachite') or the later dark green? I always thought that it was the darker green. 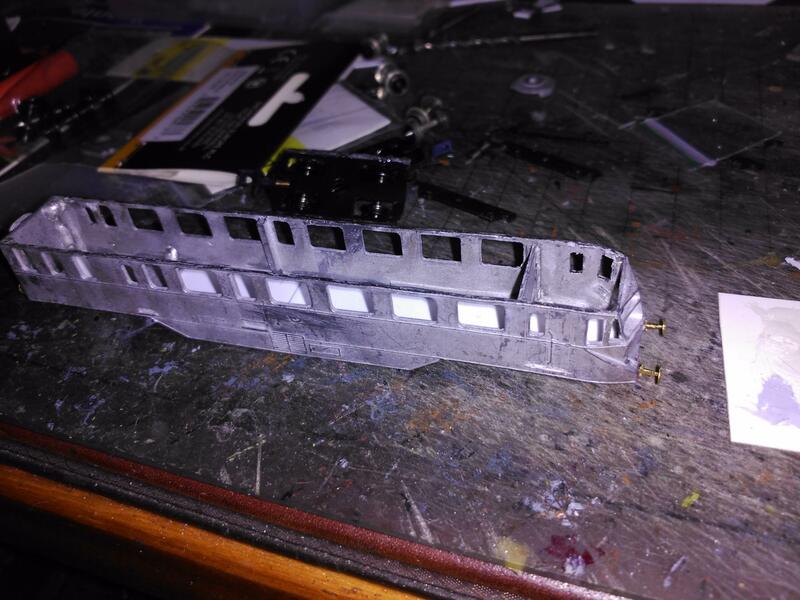 well, I realised there was a problem with the Langley Rail car, and that is that the top lights for the windows are not there!, so have started to make them from styrene. 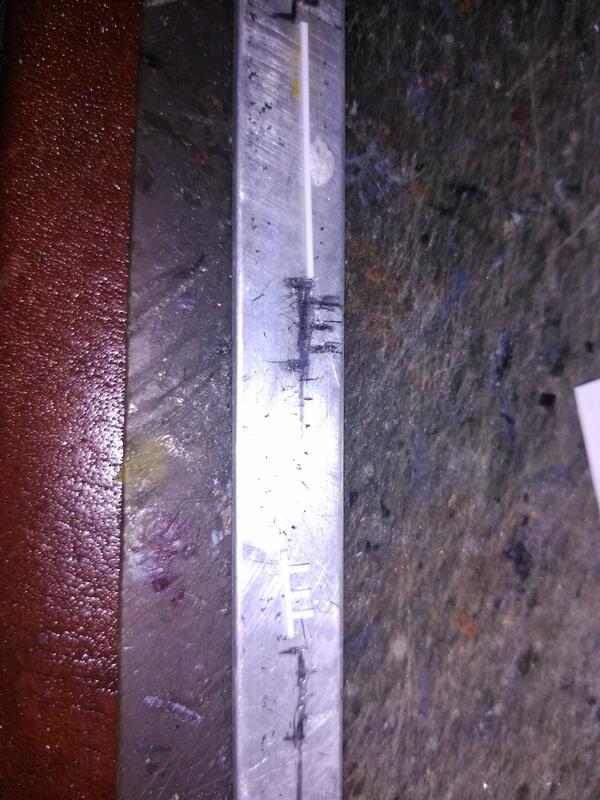 Jig for getting the spacing correct, also the graphite acts as a release agent. 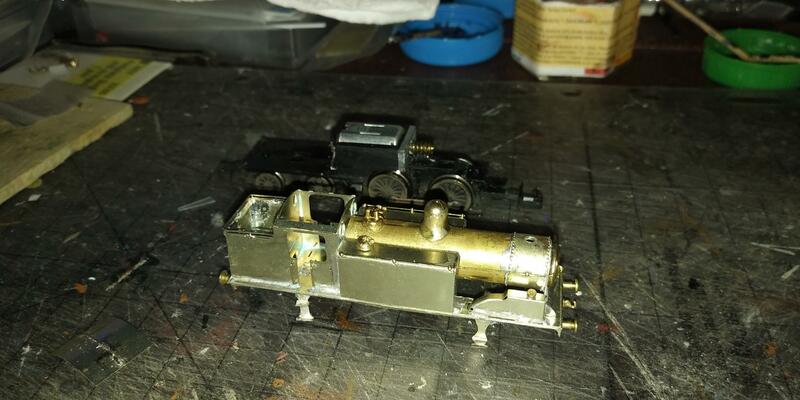 Also at the same time I started to make up these ultima 6 wheel bogies for some farish Pullmans, all solder construction, apart from the last little axle box covers, they kept getting stuck on the soldering iron tip. 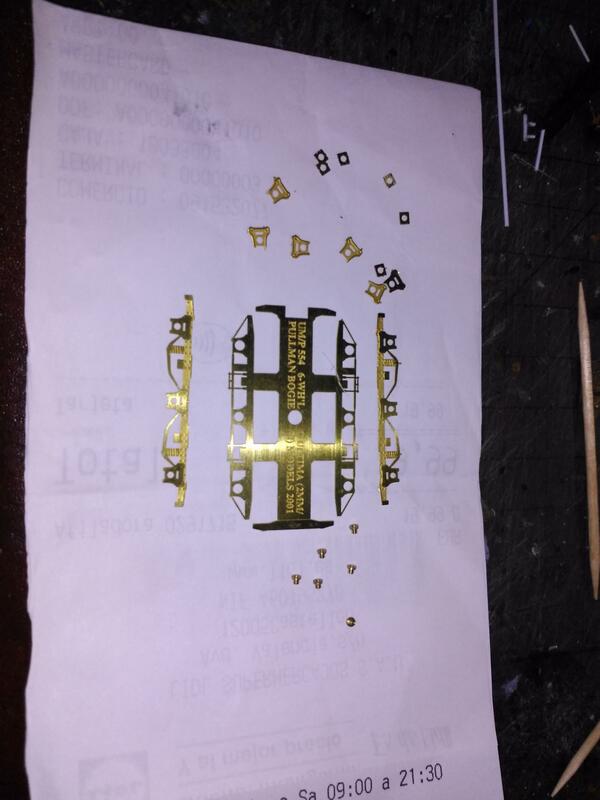 The bits cut from fret. 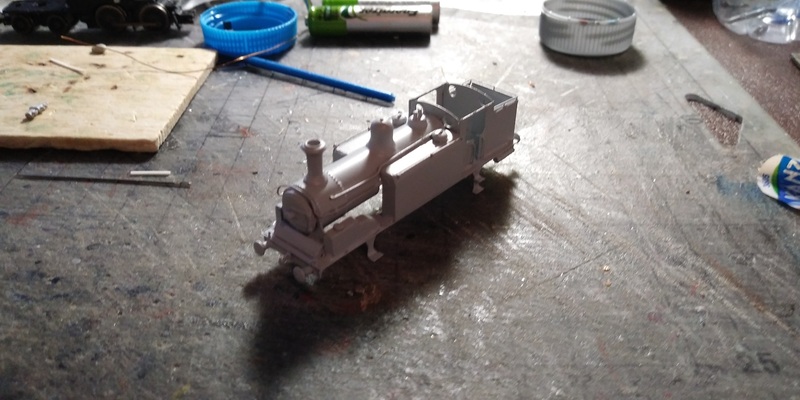 One made up, just needs painting and bending up. so that's it until next time. Many thanks, Tony, for this update. I had not realised that the top lights for the windows are not included. Your rig and, especially, the use of graphite is ingenious. 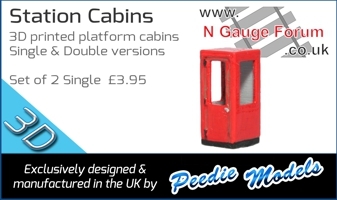 I hope you were able to download the excellent article on modelling GWR diesel railcars? 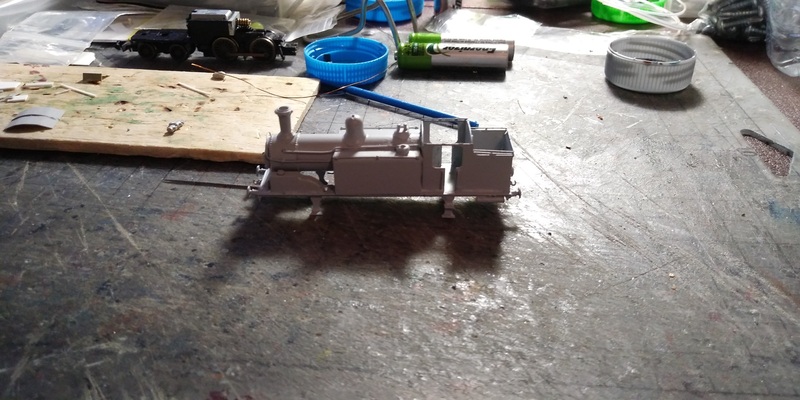 6-wheeled bogies for the Pullmans will be an interesting variation. 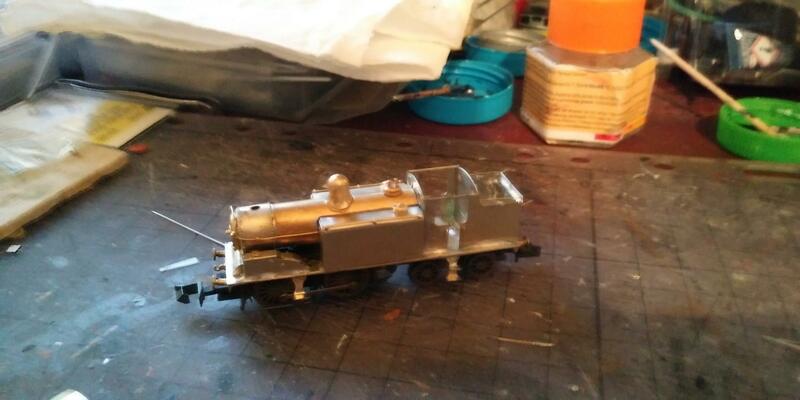 Have you thought about some brass coach kits, like Hawksworth stock not made by Graham Farish? e.g. BCK, and Sleepers? 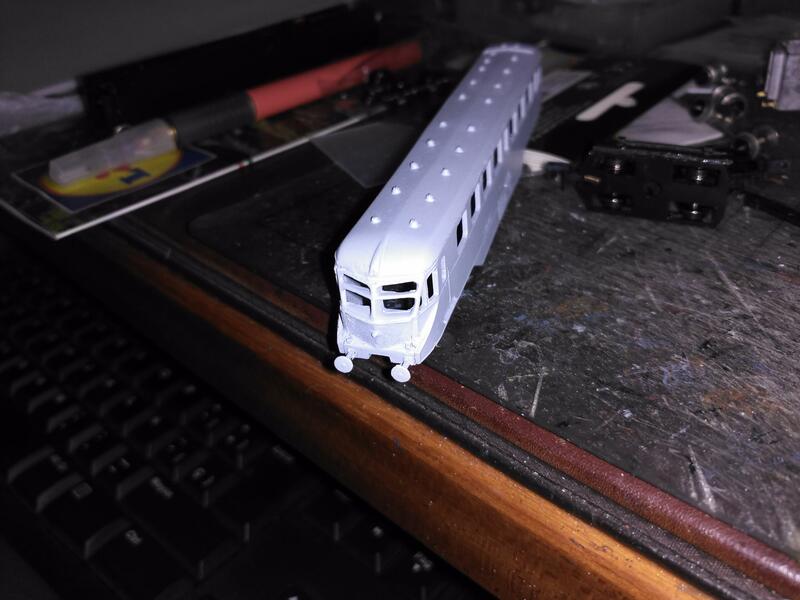 HI Chris, some where in a drawer I have a 12 wheeled restaurant car, etched brass from Etched pixels, bought years ago, but probably next up for construction, in crimson and cream of course. 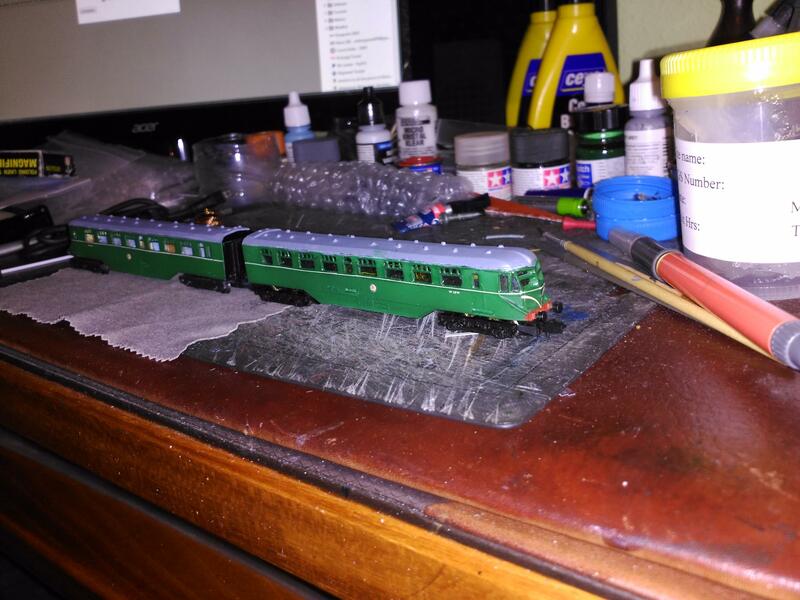 I thought also for representing a 3 car train with the rail car what about a minitrix MK1 in S.R. Green? 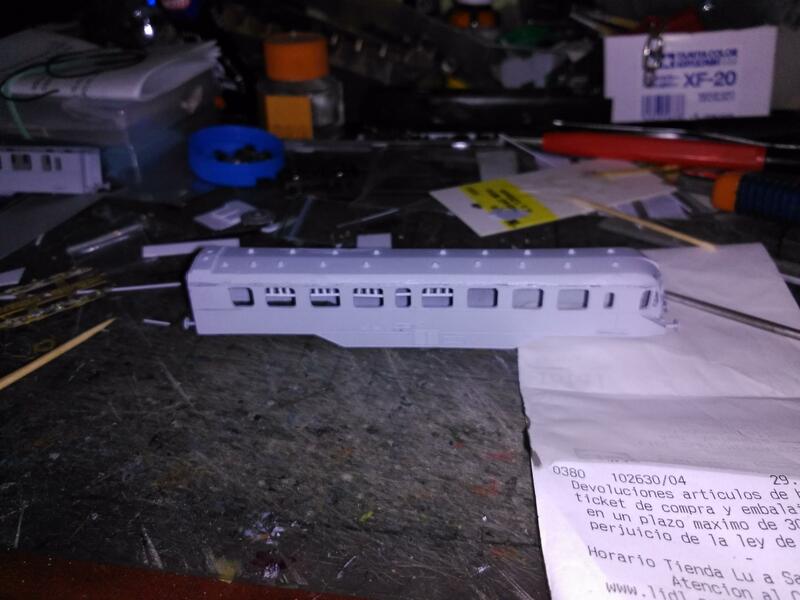 Below photos of the finished 6 wheel bogies, and windows finished on the rail cars - I did wonder about cutting windows out of some old minitrix coachs, but I would need 2 min, and prices aren't that cheap for them! 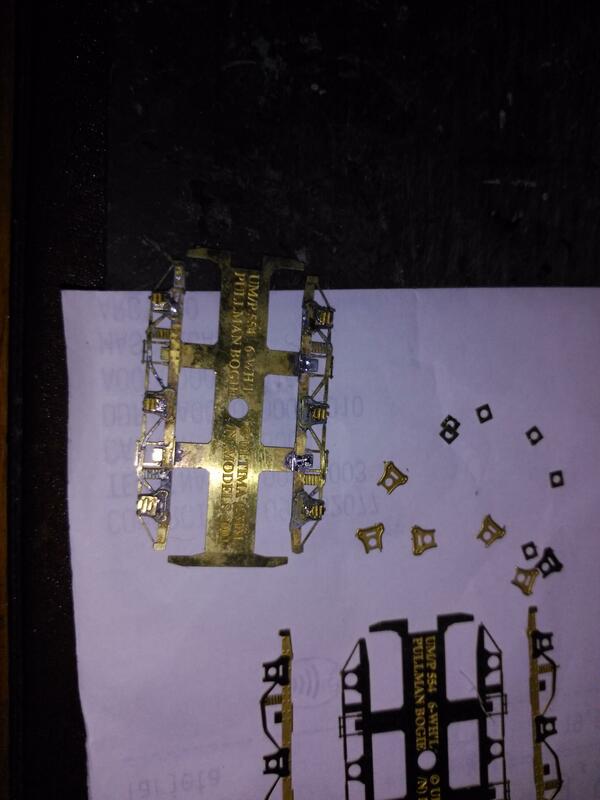 6 wheel bogies, some of the mount on the carriage has to be cut out to accomadate the centre pair of wheels. Hi Tony, thanks for the photos. and the latest update. 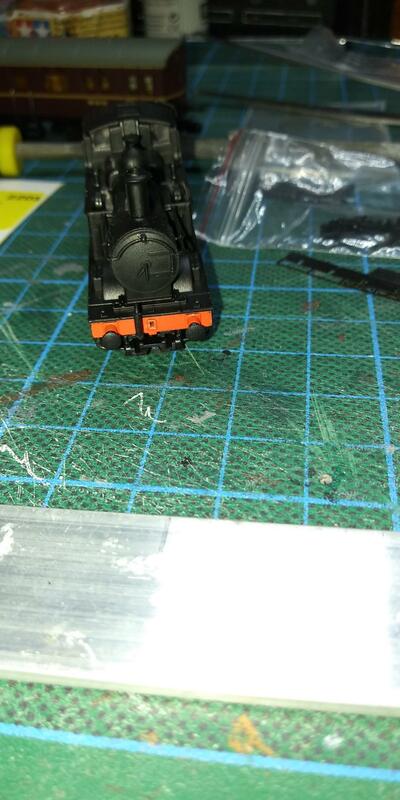 Actually, I do have a spare Minitrix coach body. North Cornwall being pretty hilly, it is unlikely that a centre car would have been used. In any case, it should be a Collett C77 Open Third coach. 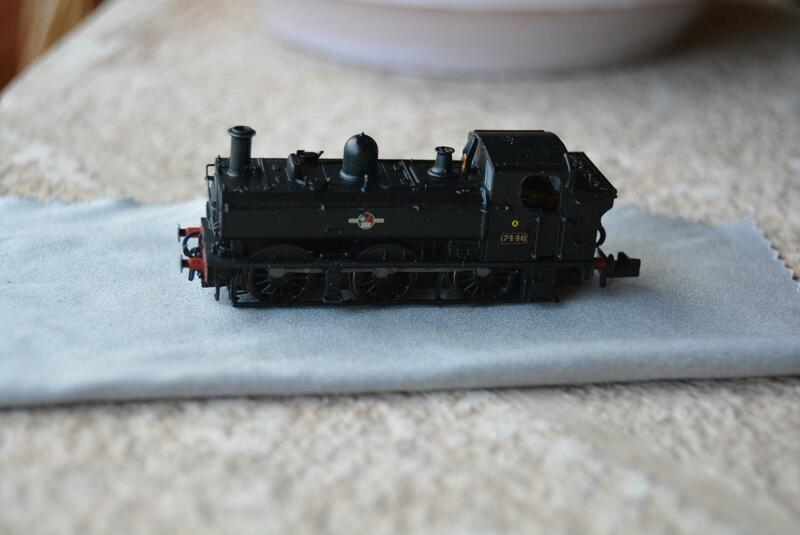 A Dapol Collett Second, resprayed and lined might do? 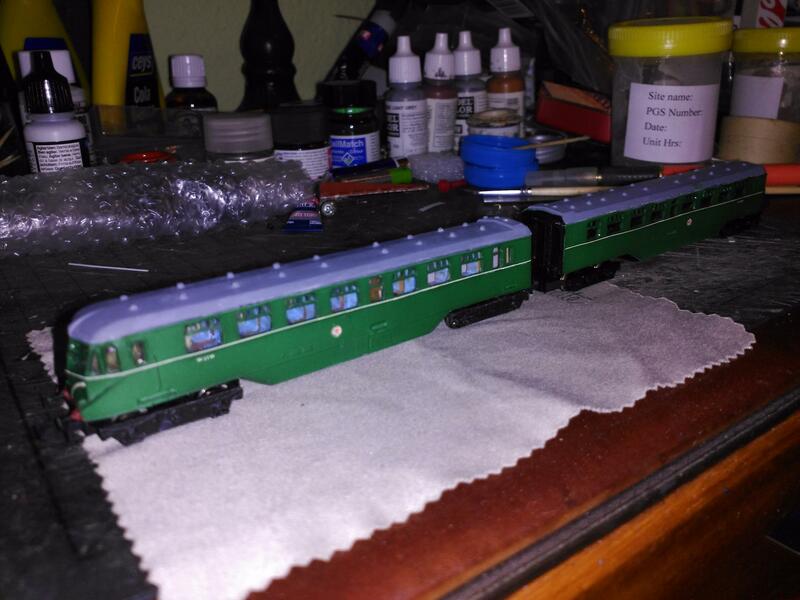 W33W+W1096W+W38W definitely received green livery; I think the dark rather than lighter (malachite shade). (Collett 1938 C77 Open Third W1096W was repainted in BR multiple unit green to work with the diesel railcar twin unit W33W + W38W.) 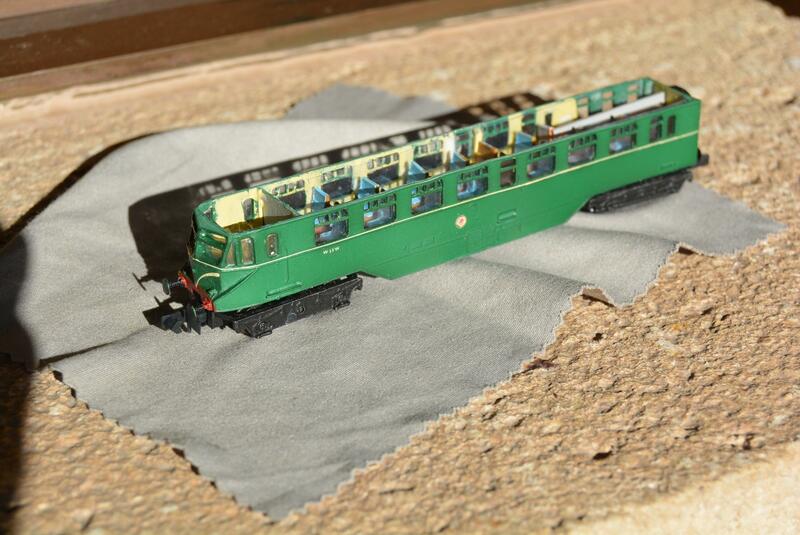 In the ColourRail phot., notice the way that the lining was applied to W1096W - level with the lining on W33W and W38W but above the waist so interrupted by the windows! 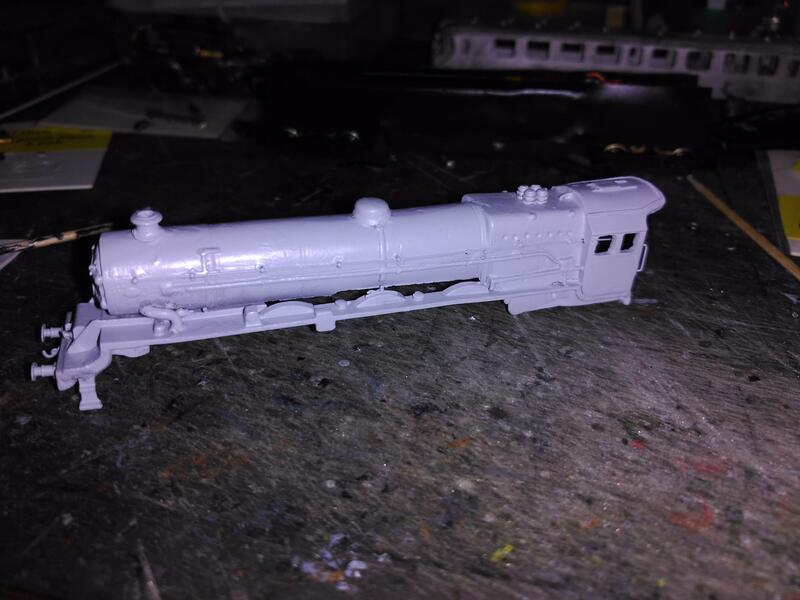 Photo of unpainted P & D marsh white metal footbridge, also made a LMS one, will have to take more photos as cant find them now. 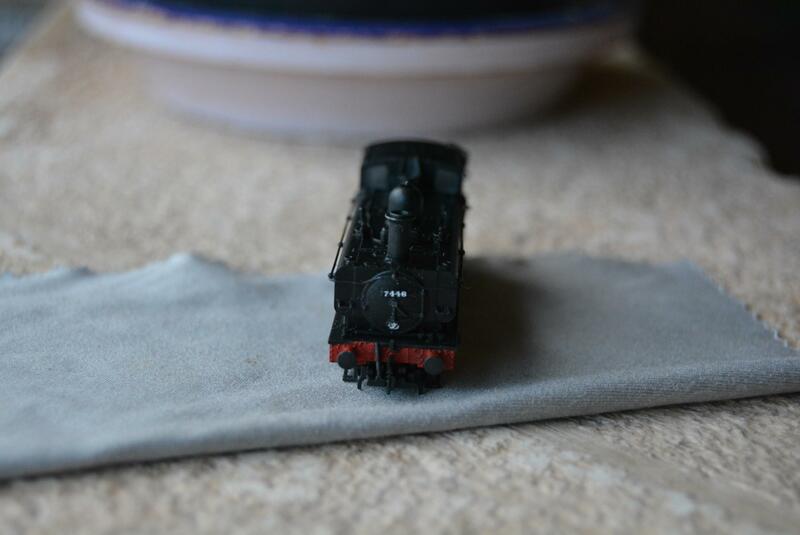 Have now started on A 3D print also, photos to follow. Many thanks, Tony. 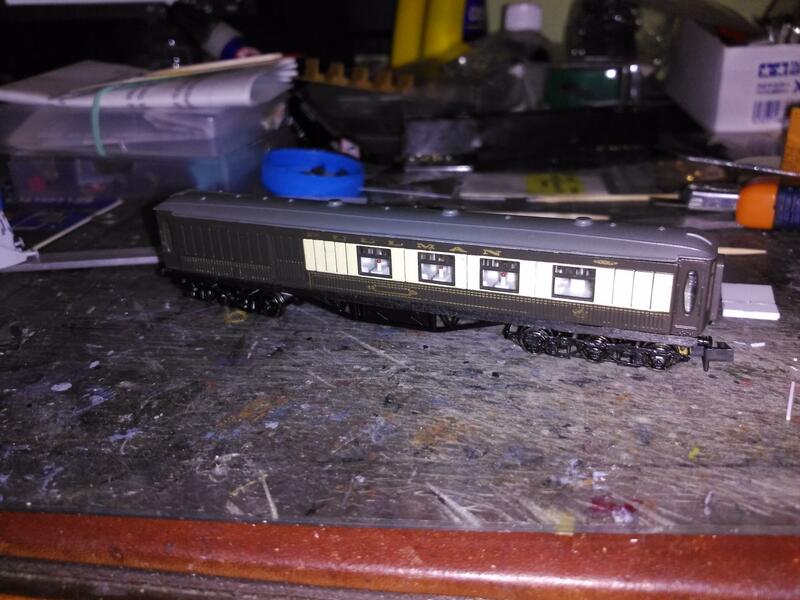 You really have done a superb job ob the ex-GWR twin railcar set. Really looking forward to photographing it, at Cant Cove, next month. 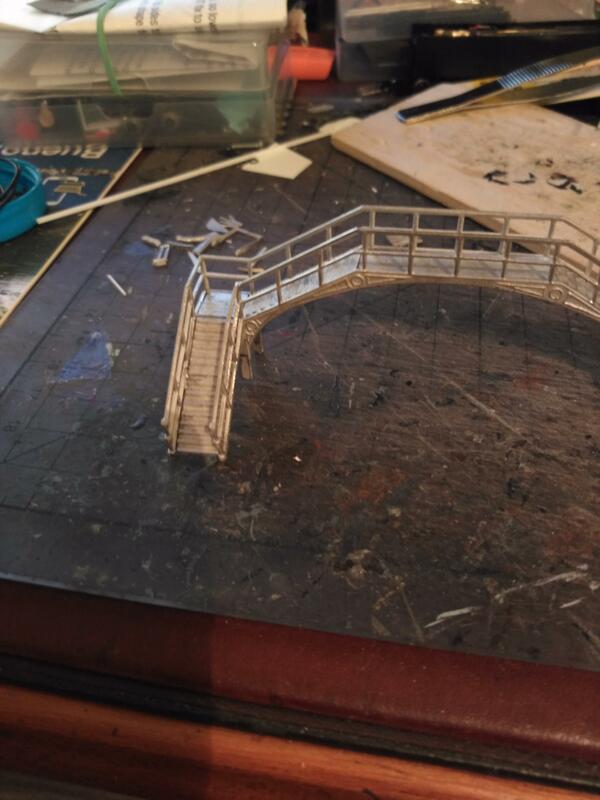 The footbridge must have been incredibly fiddly to assemble just right. so, more updates, once I had reduced the size of my photos I manged to upload them! 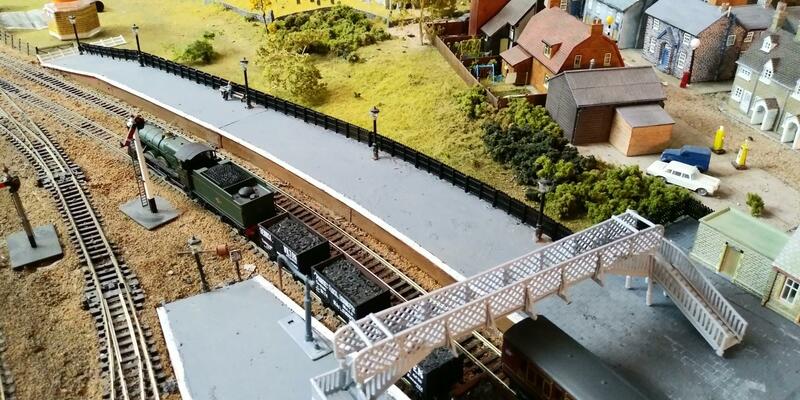 First of is an idea that I and and inspired by what others have done, I decided I wanted to change the identity of the station to other railway company's by changing the station fittings and fixings. 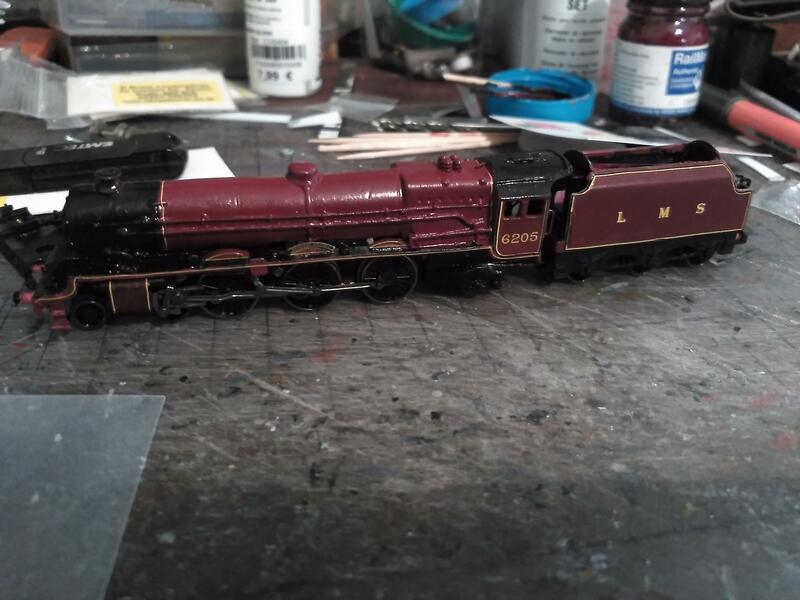 LNER - I need to scratch build some water cranes also! 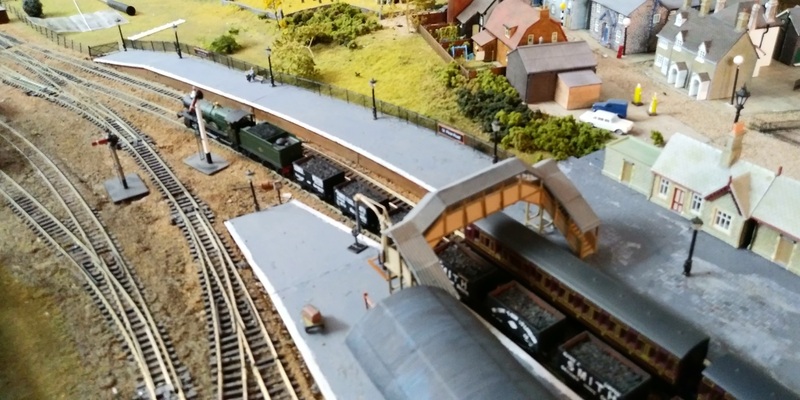 At the moment I can change the fencing (MR fencing is Slaters, but the ramp I had to scratch build, I will the gate at the end of the ramp), footbridge and water cranes, it is work in progress though. 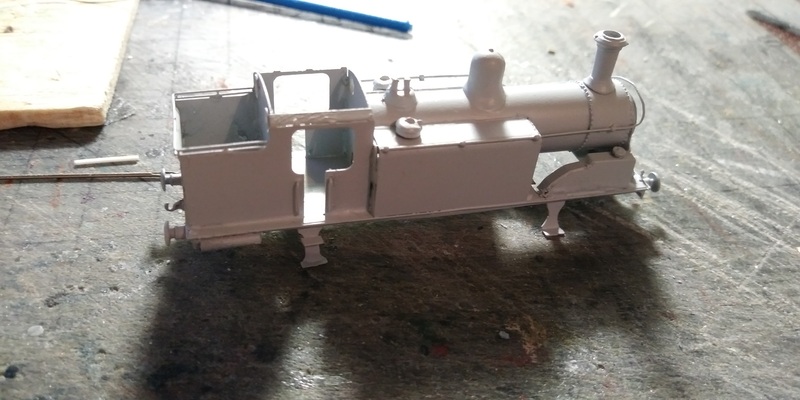 Next up is a Worsely works etched N/Silver etch of a CR 439 0-4-4- tank, I am using a M7 chassis, as basically its all there is available, though I did think of using and old G.F. 4p also. Waiting for parts to finish it now - chimney and Westinghouse pumps. 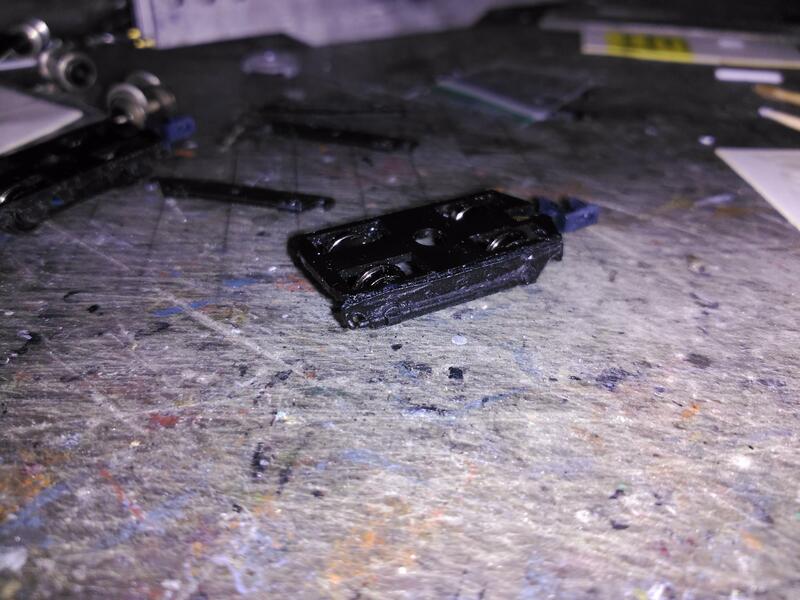 Mainly solder construction, with some super glue etc used, I had to file the motor mount and open up the clearance on the tanks, and the wheel cut-outs, as all a bit tight. 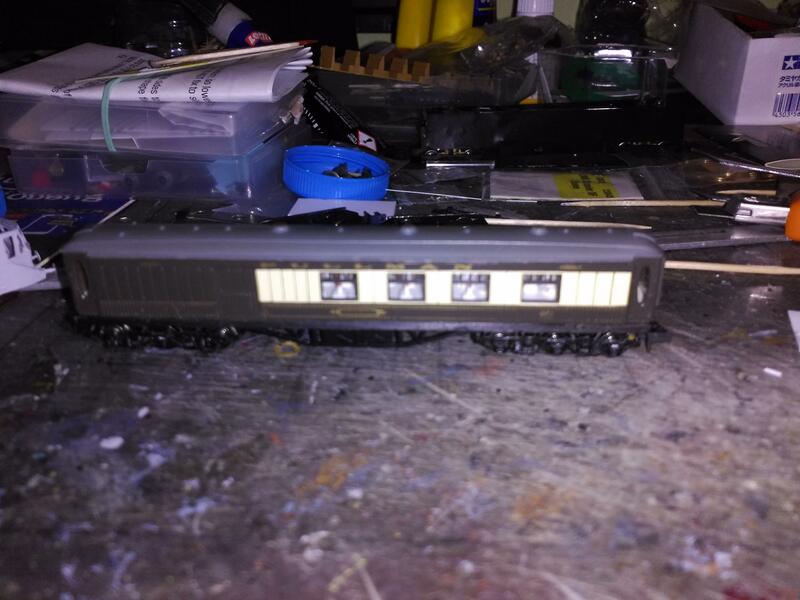 First off more piccys of the 439 class 0-4-4, now in primer, next will be LMS black, toyed with Crimson Lake idea, maybe next time? Tank filler looks like it is lifting up, but is just the angle etc, and very close up. 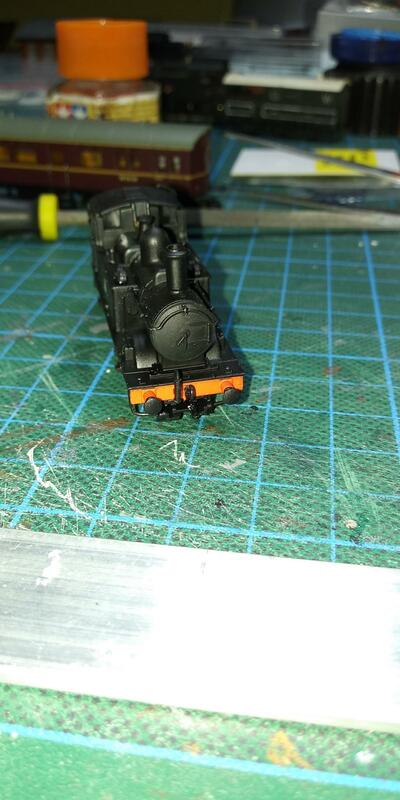 Next is a Dapol 14xx I have had for a while, but never really noticed it did not posses a coupling hook, in fact none of them do! 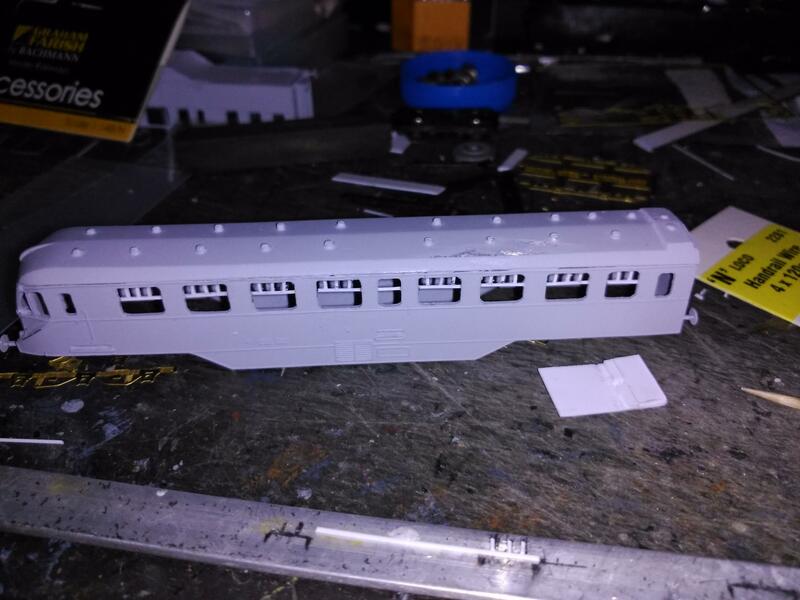 Found some spare on the DCC web site, under M7 spares, bought some and fitted them, below before and after photos. Also needs a front number plate some time. Very nice work, Tony. 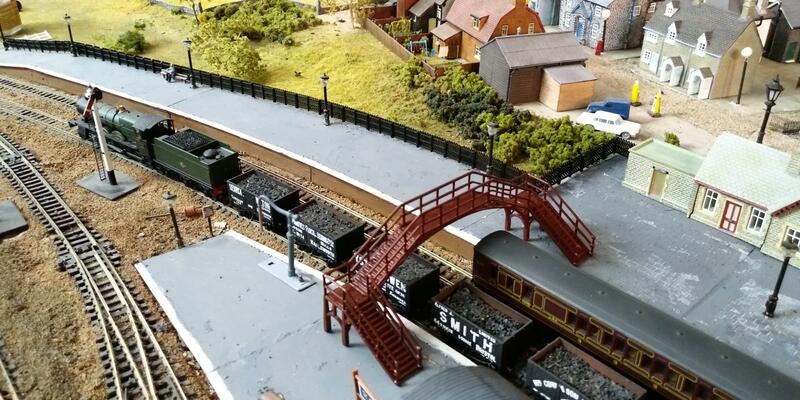 If you need to know some suitable 14xx numbers which shed(s) supplies your locos. ?